When Hormone Replacement Therapy (HRT) was first introduced, women virtually everywhere were excited at the prospect of treating their frustrating and uncomfortable menopause symptoms. With menopause having been represented as a disease for such a significant length of time, it seemed like a wonderful dream to have what was viewed as a 'cure' for menopause. Unfortunately, a dark cloud soon came over HRT as a reputable study was halted prior to completion, namely because the risks from HRT were so concerning that it was deemed unethical to continue the study. Today, there are mixed opinions and reviews of HRT – from both medical professionals and patients. While some shun the treatment purely on the basis of paranoia and fear rather than facts, others are still eager to relieve their menopause symptoms and may demand the treatment from their doctor, without taking into account their already present risk factors. At one point, it was suggested that HRT could help to lower cholesterol in women but further studies showed an initial elevated risk of heart disease when a woman began HRT, which later levelled off to show no difference of heart disease risk to the other test groups. The results of all of these studies, however, are still controversial and the reliability of testing has come under fire, which is often the case in research. At this time, HRT would not be recommended for use as a cholesterol-lowering treatment because it has not conclusively shown a significant benefit for women. Some of the controversy around HRT can be eased somewhat if we look at the facts around how long a woman is under HRT for treatment of her menopause symptoms. If HRT is only taken on a short-term course of no more than five years, it is considered safer in comparison with long-term use of more than five years. For this reason, some women will take HRT to handle the short-term symptoms of menopause. Short-term can imply only months but for most women, they would be looking at a course of HRT over at least six months to several years. A smaller number may suffer menopause symptoms for many years and they may be so severe that HRT is warranted. In these cases, the benefits can outweigh the risks. Typically, a woman's symptoms will begin rather slowly and then they will escalate, before her hormone levels start to even out at menopause and her symptoms begin to ease. For this reason, most women considering HRT would not need to use HRT over the long-term. Instead, these women would want to consider their personal risk factors relating to HRT risks as well as other ways they might relieve symptoms without HRT. Despite the controversy and questions about the safety of HRT, there are some important benefits for menopausal women. A key benefit of HRT is that it helps to reduce the symptoms of menopause. In this way, it improves quality of life for women. 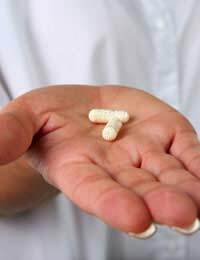 Women find that vaginal dryness, mood swings, hot flushes, night sweats and many other menopause symptoms are significantly reduced when taking HRT. It also helps to reduce a woman's risk of lower bone density – osteoporosis – a risk that normally goes up due to the declining levels of oestrogen. Another benefit with HRT is that women have a reduced risk of bowel cancer. The best way to approach the controversy around HRT is to become educated by reading information from reputable sources. Once you have a solid understanding of the risks, you can then speak to your doctor about your personal health profile and whether HRT is right for you. Some of the risk factors of HRT can be improved if you start and continue treatment while you are at a healthy body weight, exercising regularly and not smoking. Family history should also be taken into account, which means that if you have a strong family history of breast cancer, for instance, you might feel this warrants avoidance of HRT. Don't forget that although HRT is indeed effective at relieving some of the symptoms of menopause, it is not the end of the world if you are unable to take HRT. There are many natural remedies and treatments as well as other prescription ones that are promising for relieving menopause symptoms. These don't carry the same risk profile in comparison with HRT. With some careful education and consideration of your health and HRT, you can make the best choices for how to approach your menopause symptoms.